We agree, and therefore we are pleased to announce that at its May 14, 2016 meeting, the ABCNJ Council affirmed the appointment of Rev. 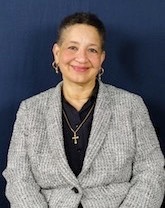 Estelle V. David as the new ABCNJ OPEN Pastor for the Sacred Safe Spaces ministry. Rev. David proclaims, “I am a friend of God.” She is an advocate of building the Beloved Community which is characterized by people who have mutual respect, truth, justice and harmony embracing their diversity for the greater good. The needs of the community have always been a passion of hers and she has worked as a community builder in many sectors - grassroots, public, private and faith-based community corporations. After 14 years as Prison Chaplain at Edna Mahan Correctional Facility for Women (EMCFW), December 31, 2015, she retired. Rev. David believes that the role of the church is to honor each of God’s creations so that we can use our gifts, strengths, perceptions and complexities to be our best, growing in peace and glorifying God! Has your congregation endorsed the ABCNJ Congregation Covenant of Nonviolence? You can copy and personalize the covenant from our web-site. If your church endorses, this covenant, please send the region office a signed copy!